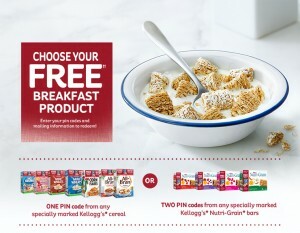 Look for specially marked boxes of Kellogg’s cereal or Nutri-Grain bars to claim a free breakfast product. You’ll need either 1 pin code from a Kellogg’s cereal box or 2 pin codes from Nutri-Grain boxes. Visit the Kellogg’s website and enter the pin codes (valid one time).